This is a strange incident captured on video during the Houla massacre of May 25, 2012, near the center of Taldou around 6:30 PM. This page will analyze this complex video scene and related clues. Along the way we see the most famous visual proof or government shelling is a possible rebel fighter firing rocket propelled grenades, and how his apparent victims were displayed alongside the domestic massacre victims blamed on government forces. 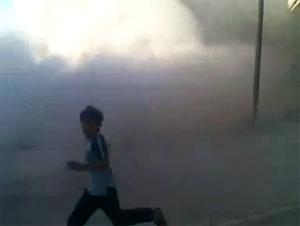 boy running from the "shelling"
The original posting hasn't yet been tracked down, but a video of 4:42 duration was circulating by May 29. One opposition re-postingof that day (with slightly useful English sub-titles and good resolution) explained "This footage, uploaded by Syrian democracy activists on May 27, 2012, depicts the initial round of artillery shelling against the town of Al-Houla in Homs." This will be the baseline reference video here, although this possible original posting of the video (on May 27th) might have the same exact time stamps. Telegraph edit of the video "Amateur video believed to show Houla massacre" 1:09. Published on May 29, 2012 by telegraphtv. Desc: "Horrifying images from an amateur video uploaded on a social media website are believed to come from the Houla massacre which killed over a hundred people last Friday." The Guardian "Video footage recorded on mobile phones by terrified Taldou locals shows some of the men trying to rescue the women, children and elderly men who were trapped in their homes, some of which were being splintered by artillery and tank shells. The rescuers scrambled to an area that had just been hit by a shell, killing at least two people who had been in the open. The video shows more shells crashing down as they tried to drag the victims to safety. Sometime between 3.30 pm and 4pm, according to locals, the shelling eased. There was, however, to be no reprieve." A still is presented, about the same one inset above. Caption: "A photo [sic] taken by Syrian activists is said to show Houla residents fleeing shelling. Photograph: AP"
The page linked to This is the video, a 1:25 edit hosted by the Guardian. The video is shot around 6:30 PM, hours after the "the shelling eased." Description: "Unverified video uploaded to a social media website purports to show the shelling of Houla in Syria on Friday, which left 108 people dead. People are seen fleeing as explosions and gunshots are heard, and several people appear to help an injured person on the ground. Survivors have told UN investigators that most of the victims died in two bouts of summary executions carried out by pro-government militia"
The video has been just as commonly re-posted by government supporters (such as كشف حقيقة مجزرة الحولة 25-5-2012.avi (first portion, about 5:00) and also here (at 2:38). That's primarily because of one obvious feature of it the other videos seem to ignore-the apparent perpetrator of the "shelling" right there amongst the rebels, and none of them are stopping him. Early in that loading sequence, at 2:56, a loud blast is heard nearby, jarring the cameraman. He foolishly pans towards the source, just a few yards up the street. In the same smoke cloud,refreshed with the new firing. There we see a man in a dark shirt and light pants first falling into the cloud of smoke, then rising, holding a horizontal device like a bazooka or RPG launcher. As he stands, the device sticking out at an angle, we can see his head is dark with hair, while it had been white, presumably with a head-scarf (Khaffiyeh) when he first tipped over (see inset). His compatriot at the corner, just a few feet away and wearing greenish robes, seems to have backed away at the noise, covering his ears. The armed man confers with him, gestures to the street, and he runs out in the street like a terrified local fleeing the "shelling." The armed man walks towards and past the camera as other locals are urged to run away from him. The weapon is seen with some clarity, hanging alongside his right leg, as he nears the camera. As he passes, it pans away from him pretty quickly, down to the ground. He's only visible for a few frames here. Some unclear loud noises happen then (gunshots? metal door banging open? - that distortion happens with anything loud, even shouting), and someone goes into a doorway, but not our killer. He proceeds down the street to the south, passing the camera at 3:15, firing again and again. Further blasts happen at 3:28 and 4:00. The camera tries to ignore the first of those, but later pans south at 3:39, showing a similar cloud dissipating about walking distance in that time, half-block or so away, at the mouth of an alley he apparently disappeared down. It would be amazingly coincidental if the man with the RPG launcher kept being at the locus of artillery shell attacks yet continued walking. The following video, by wiki contributor Caustic Logic, shows all the relevant visuals, with a stabilized and enhanced detail. There is, however, some room for doubt here and some questions worth addressing. The man is not seen firing any grenades, leaving the possibility he was simply near the spot where a shell came down. 25 frames after the first on-screen blast, he's tipping over as if losing balance from the recoil, or possibly from some external blast wave. Both he and the robed man seem completely uninjured by any blast, and only one of them tipped over - and it was the one who might suffer recoil if he were the one firing. There are many videos we could look at of RPG launchers firing, but three incidents from Taldou, likely on the same day, are included in this rebel brigade video, at 1:42, 2:10, and 2:43. Two locations are shown, both located on a side-street connecting to Main Street just south of military intelligence HQ (the last scene from the intersection, at building 720E as listed on the Main Street page. In these cases, there are clouds of exhaust very like what we see on Saad street, especially the latter two; a little in the rocket's path, more trumpeted out the back end of the launcher. In both cases, it's thinner than seen in the 2:56 blast on Saad street. In that case, the guy would have been backed up against a wall with a low overhang, so the cloud in back should be dense and rolling, as it is. Contrary to claims that distant shelling had explosives "crashing down" in this scene would seem unfounded. The explosives were traveling from the apparently opposition-populated scene to somewhere nearby to the north or northwest, and all moving pretty much horizontally. The four victims picked up off the street are of some interest. We can't tell if these are pure civilians, civilian fighters for either side, off-duty soldiers dragged out and killed, or what. They're all roughly fighting age men, one a bit older, but they wear civilian clothes. For reference purposes, we'll call these victims A, B, C, and D.
The nearest one, arriving as the cameraman does from the south, is A, a fit young man in a gray t-shirt scrawled with "DON'T STOP THE ROCK." The rock was cut off the knees, one leg gashed open and folded behind, the other also fractured, his jeans either torn down by that attack, or pulled down on purpose in disrespect. What exactly he died from isn't clear. From the waist up, he seems intact, but also dead. Victim B is clearly dead: the back half of his head, and possibly upper spine, are blown away, leaving only a flopping face, here folded under invisibly, elsewhere quite clear (see below). His blood covers the sidewalk and might be splashed onto victim A. He wears a distinctive short-sleeved shirt of yellow and purple/brown stripes. Worthy of note is that both of these sets of informal clothing seems fitted to the possibility of being fighters. A bit apart are victims C and D in more conservative, but Western, and non-militant, dress. C wears a white checked button-up long-sleeve shirt, tucked into khaki trousers, and a belt. His only sign of injury is a spot of blood in the middle of his shirt and dripping a little onto the ground. Behind him, nearer the wall, is victim D, dressed about the same, but his shirt is pinstriped. Beneath, here and elsewhere, he's wearing a bright orange undershirt and another black shirt beneath even that. He seems to be older, a little overweight, his face down in a pool of blood, exit wound in the back of the skull. He was probably executed by gunshot here, rather than dying from shelling, even by the RPG-firing rebel fighter. 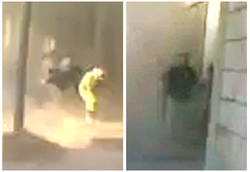 All four of these bodies appear widely in opposition videos, starting here. Loaded in the van, they're last seen here driven south on Saad Street. By matching clothes and various other details, all four can be seen clearly enough in some apparent hospital. This video might be raw, and mediaInfo gives a time-stamp of UTC 20:52:52 (although, like all the videos, it gives the wrong day - an apparent glitch - see Talk:The Houla massacre#Timeline Problems: May 24, Anyone?. Therefore it possibly was recorded at 8:53 PM, over two hours after the pick-up. CPR is being performed on victim D (with his orange and black undershirts and pants now down), but it apparently didn't work. Victim C seems to be in a different state here -see below for details. Either before or after this, the men were seen in a particular room, arrayed with at least 12 other victims of the normal massacre type: what seems to be two families, with many small children, killed in their homes. There are three views of this scene: The first video has poor resolution and a strange crawling "tracer" effect. Nonetheless, it's got some light and is the most useful for identifying the four Saad Street RPG incident victims in the "top" row, nearest the wall. In the left position, the most recognizable one; even with his arms crossed over his chest and a wedding ring visible, we can still see the "ON" and "CK" of "DON'T STOP THE ROCK." The positions in this row of six, all adult men: 1: A (see 0:45), 2: C (checked shirt, consistent face, 0:48), 3: D (same shirt and pants down as at the morgue, hands now bound in the front, unlike before, for no clear reason - 0:50), 4: someone else (0:55), 5: B (barely discernable by the stripes - 0:58), 6: someone else (1:00). The two someone elses are presumably the fathers of the two young families arrayed at their feet. The second, darker view doesn't really help at all, it's just too dark. A third view is a bit more helpful, but seems to be missing two of those victims, A and C on the left (replaced with two other young men, or vice-versa), while B and D are still recognizable in their spots. Finally, at some point still in daylight on the 25th, the four were seen being loaded into the bed of a pickup truck. It seems to be on that same truck that victim B was shown in a mid-resolution opposition photograph. 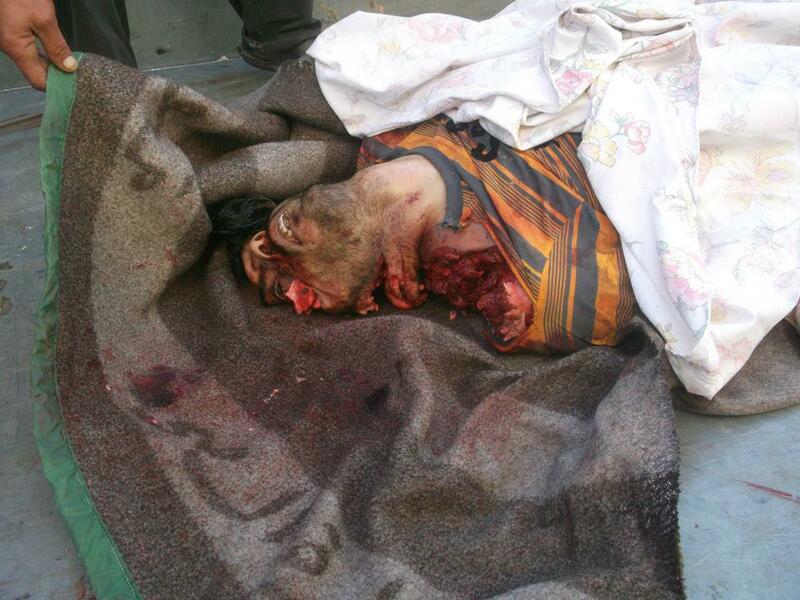 He's shown face-up, on a green blanket with Arabic lettering, which might be of some interest. Strangely, victim C (or someone looking and dressed just like him, in the company of victims A, B, and D) is in a much different state when seen at the clinic. In that video, he has his, or someone's, guts - apparently intestines and whatever, and blood, outside his body, laid on top of his shirt. For realism, his over-shirt is pulled up partially, but his undershirt is still tucked in, beneath the pile of guts laid on top of him. His shirt, obviously, is much bloodier by now. along with lots more blood (see 0:33 and 1:12). It's not clear if the guts are even human, but they're not likely his. Why exactly any of this apparent fakery was inserted into an otherwise convincing scene is not at all clear. Nonetheless, as noted above, a man looking like him, same shirt and face, was again laying (perhaps without the guts, that's unclear) with his three fellow corpses one more time at that home/morgue (here, 0:48). It's possible but not at all certain he was finally dead by that time. Flashback to the sidewalk where these dead and ostensibly dead people were first made so mobile. Who the people picking them up are, their political/sectarian affiliation, is crucial to understanding what's happening here, and impossible to be 100% certain about. The fact that they do not try to stop the RPG-wielding "shelling" perpetrator, and in fact do little but try to ignore him, suggests they're all on the same team. Once the bodies are secured and mobile, everyone starts running south with the truck, towards where the shelling perpetrator was last seen, apparently to flee (the scene of) the shelling now that it was done. The editors of this video seem to think the children running in terror from the shelling are laughing, perhaps at the big game they're all playing (see 5:04). It does sound kind of like laughter. The scene of this crime was filmed the following day, emphasis on the blood stains, real and/or fake, and better resolution on the surroundings. This page was last edited on 9 January 2015, at 14:14.